We are in the middle of the last house project for this year – changing a bath tub to a shower stall. 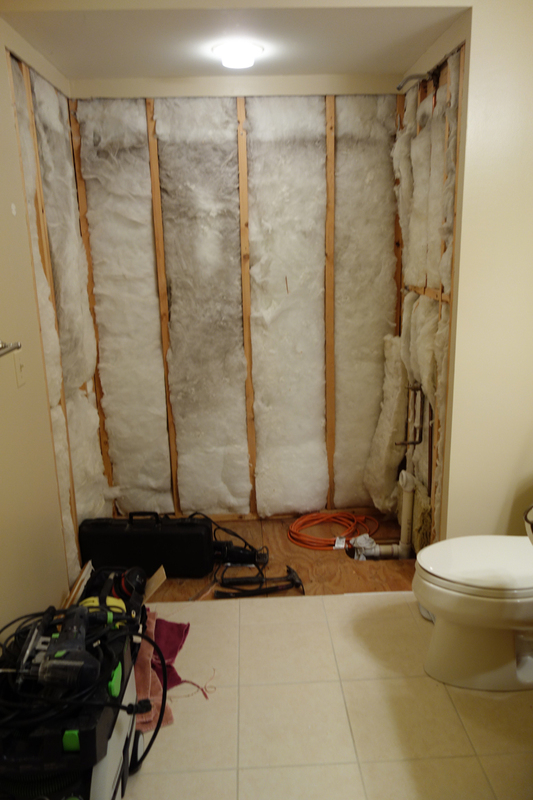 The old tub and surround is out so the insulation is exposed. For this reason I don’t want the cats in there. I keep the door closed. I went in there for something. The door didn’t completely latch behind me. In a nanosecond I had three cats (all of which were sleeping deeply when I came up the stairs) roaming around the room and sniffing. They are much more curious when they aren’t allowed somewhere. Mollie had already explored the room when she snuck in on another visit. She took this opportunity to continue her nap in the sunshine. Gracie: I heard a door open! Although the porch has been “winterized” with the furniture grouped and covered, we left some old cushions out there on chairs. On a really nice day Morgan or Hazel will sit out communing with nature. Gracie and Mollie are wusses and prefer to stay in the warm house, preferably in a sunspot. All the cats wish you a great weekend! Mollie snoozing in the sunshine! 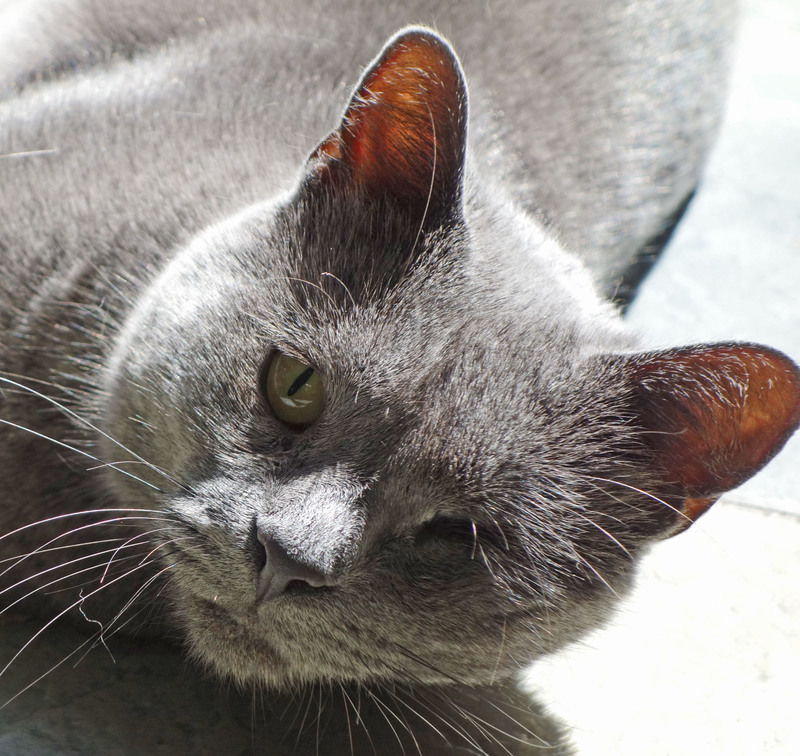 This entry was posted in For Animal Lovers Only, Humor, Sassy cats and tagged animals, cat pictures, cats, Gracie, Hazel, Mollie, Morgan, pets by Kate Crimmins. Bookmark the permalink. Cats have earned their reputation for being curious creatures. And isn’t it interesting that their curiosity is heightened when they know they’re discouraged from entry. I think it’s so great that you continue to put some cushions out on your porch even though it’s “closed for winter,” so that they have a chance to find their favorite sunspots! They are so entertaining to me, Kate. LOL! I’ve always had a soft spot (some say in my head) for animals. I have 4 bird feeders going year round but I recently put out the suet and I bought 10 lbs. of corn cobs for the winter. The frogs are hibernating and the fish are cozy at the bottom of the pond for the winter. We see less chipmunks as they also hibernate although the wait longer. The cats, especially Hazel, enjoy an hour or two on the porch during a mild day in the winter. Morgan will join her sometimes but the other two don’t like the cold at all. They tell me they are tropical cats. Cats! So curious and such troublemakers! Hope your tub replacement project goes smoothly. Are you guys doing it yourselves, or do you have contractors coming in? We took out the old. The rest is contractors. My husband does not like to do plumbing or vertical tile work. Doors and Boxes are the keys to the hearts of cats. The curiosity of the closed door… irresistible. That’s going to be a great walk in shower, I just know it! We are about to take on the bathroom renovation… we are in the queue. It seems like we have been waiting forever. Had to put if off for company in October and then we changed our minds about the material for the floor of the shower. Enjoy your weekend, Kate! It won’t be a great one but a good one. We have to keep the footprint of the tub space. It will be better and it’s not our walk-in shower which is fabulous! I like room to swing my elbows! Yesterday I went up and the door to the bathroom was open so of course I asked the beloved husband about it. He denied going in there. This morning I found the culprit. You have to pull the door hard to secure the latch. If you don’t a very strong push will open it. Gracie has learned how to throw herself against the door to open it. What a cat! Of course Gracie figured it out! She is going to keep you on your toes! She’s very good at sleeping! Have a super weekend with loads of naps and sun puddles for all. Too funny! My cats are the same, they always want to be in the room with the closed door more than anywhere else. Cats do not like closed doors ever! Barney used to hide in the bath when there were fireworks or thunder. When we had a slight mishap with some paint remover and the bath dotted like a puking Mr Bobby, we took the bath out and installed a shower cubicle instead. He was confused as he couldn’t get in the cublicle, so just sat on the raised plinth where the bath used to be! He was lovely and he and Maggie would have made beautiful puppies. We took our tub out too. I am loving our shower. Everyone said we needed a tub. Nope, we don’t. We have no small children in the house and we’re not selling any time soon. We got a teak stool to put at one end in case someone needs to sit in the shower. You are lucky, we had to gut our whole bathroom. Fortunately the cat is mostly an outdoor cat and had no interest. The bathroom wasn’t worn so we didn’t have to gut. We may change out the toilet and get a higher one because we like them better but we don’t need to do anything to floor or vanity. My cats always have an interest in house projects. They need to approve them. Nope, you don’t need a tub. We still have one but I wouldn’t worry it for resale. I hope you’ll write about the new shower when it is finished. You could give us the cats’ opinions. It will be interesting. Hazel liked to jump into the old tub every morning. Don’t know why but with the doors closed she won’t be able to access the shower. Wonder what Hazel will think?? She’s think it’s a dumb idea! It doesn’t end up in more food or catnip so what’s the point? Just another human folly. Ah, cats. Fastest way to get them to love the new scratching post? Keep taking them off it when they climb on. Do not tell them it’s just for them! Your cats are so human! Yes and I’m so catlike! Haha! So cat-typical ~> nosing about to be in the know! Morgan: So, um, what did you guys think about the renovation? Grace: Not much. Mollie is so dead! I can’t believe she made such a big deal about getting in there to look around. Boring! Hazel: No mice. No treats. Not worth the price of admission. I’m going back to nap. Grace: Me three . . . but first, I have to have a cat chat with Mollie. OMG! You know my cats! Of course I do . . . because you’ve done such a terrific job of sharing their personalities with us! ‘Snoozing in the sunshine’ sounds like a perfect plan. Wishing you and your cats a great weekend! Like Mollie, when the cold days of winter settle in, I seek out the sunspots in the house…it’s so nice. Have a great weekend, Kate. Thanks! You too! Go Eagles! They need to beat those ole Cowboy! Yes. Important game! Hope it’s not a nail biter. We never let our cats into our unfinished basement because of the open insulation. You just know that a cat will try to eat it. You remind me that we need to get the furniture out of our porch and put in the basement. Winter is a’coming. Winterizing is never as fun as opening everything up in spring. That is a joyous occasion. I hope the rest of your bathroom reno goes well. Mollie looks SO CONTENT snoozing in the sun. I wonder how I look when I sleep? Umm, probably not so good! Mollie is beautiful no matter what she’s doing. I, on the other hand, would have my mouth hanging open at a weird angle! that’s on my bucket list too… but I have no tiler by now… sigh… crossed paws and fingers for a fabulous shower you will love! We’ve wanted to do it for a couple of years. Projects always take longer and cost more than you think they will!